Founded in 1899, Simmons College is a women’s college at the undergraduate level, but does have male graduate students. There are about 2,000 undergraduate women and about 3,000 students in graduate programs in nursing, management, social work and library science (this is a top 10 program). Main Academic Building at Simmons College, founded in 1899. The campus is in Boston’s Longwood neighborhood, 2 blocks away from Fenway Park. Simmons is a member of the “Colleges of the Fenway” Consortium. The other schools include Emmanuel College, Massachusetts College of Art and Design (MassArt), Wentworth Institute of Technology, Wheelock College, and MCPHS, the Massachusetts College of Pharmacy and Health Sciences. Additionally, Harvard Medical School, Brigham & Women’s Hospital and Boston Children’s Hospital are in the same community. Simmons students receive a liberal arts education with a focus on professional preparation. The strongest programs include nursing and physical therapy, as well as marketing and psychology. [All 50 majors are listed here.] All students are required to do an independent learning experience, worth 8 credits, geared towards getting them out of the classroom and into their field. Projects are different for different majors; students may propose projects to their professors for this requirement. Simmons also encourages students to do internships and other practical experiences. While there is no core curriculum, students must take courses within six different “modes of inquiry,” similar to distribution requirements at many colleges. Professors do all of the teaching; the student-to-faculty ratio at Simmons is 13:1. The Residential Campus at Simmons, separated from the Academic Campus by Emmanuel College, is secure. The residential campus is separated from the academic campus by about a block; Emmanuel College is actually between the two. The residential campus has traditional brick dorm buildings arranged around a grassy quad, with the dining hall at one end. The entire residential campus is gated and students must use their ID cards to enter after 10 pm. Simmons students may take courses at any of the other colleges in the Colleges of the Fenway Consortium, and some extra-curricular activities are available through nearby colleges as well. 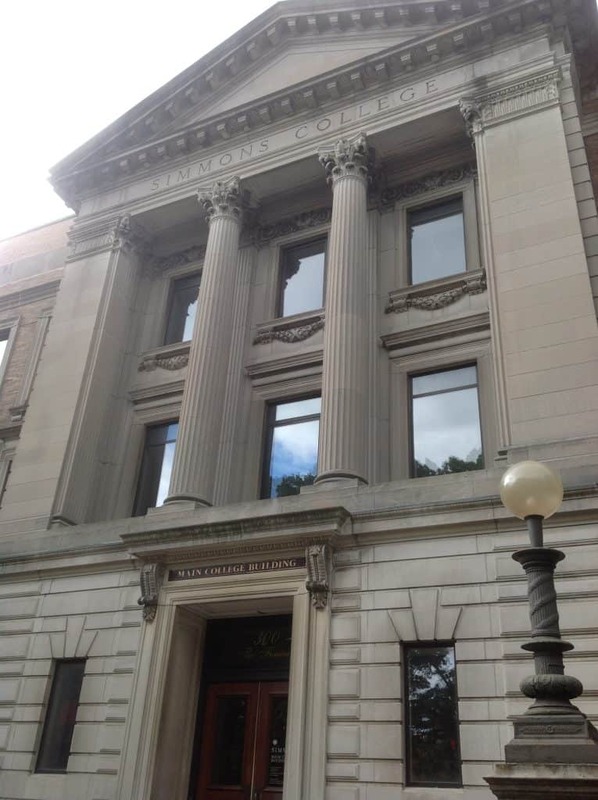 For example, Simmons does not have sororities, but students may join sororities at Boston University or Northeastern, just a few blocks away. Students say that Simmons is a very academic atmosphere; the social life is robust but academics come first. Simmons “helps women find their voice,” according to a senior history major who led my information session. The Honors program is team-taught and gives students the opportunity to work even more closely with engaged professors (and there’s a book stipend!). About 45% of Simmons students are from outside of Massachusetts. Students are not allowed to have cars due to very limited parking on campus but public transit is close and discounted. Students also have free admission to all of the local art museums, including the Boston Museum of Fine Arts, just a block away. My tour guide (different student than the one who led the information session) had transferred to Simmons after a year at George Washington University in Washington, DC. Having experienced a large school feel at GWU, she appreciated the close relationships she was able to build, as a transfer student, with other students and faculty. 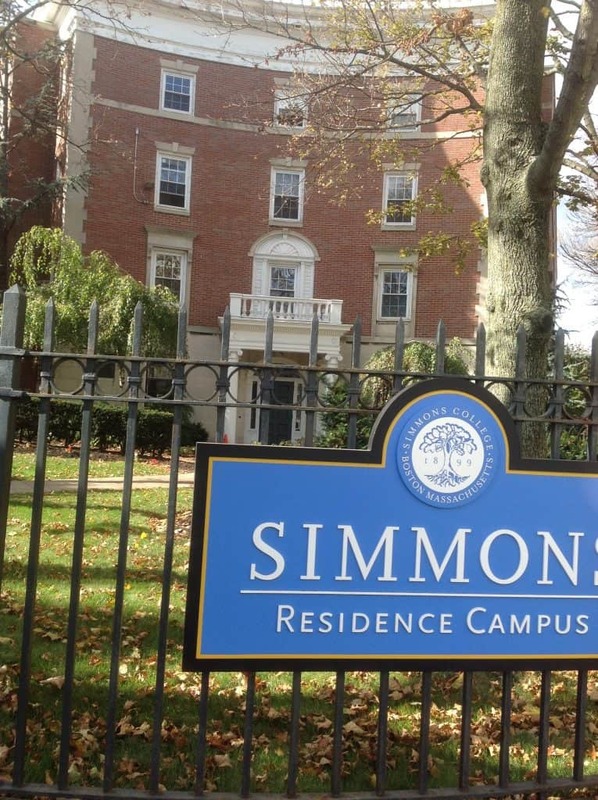 Like many women’s colleges, Simmons has an empowering vibe to it; unlike many others, it’s right in a major city and immediately adjacent to co-ed colleges, so students don’t feel like they are missing anything socially. You can see all of my photos from my visit to Simmons College here.